The above article is an initiative of Netcore Solutions and is intended to create awareness among readers. As consumers, today we rely on ‘Search’ all the time to throw up precise results, we like to access recommendations for everything from stocks to music playlists, we appreciate it when service providers resolve our queries over 24x7 chats. This is the power of AI, which has enabled marketers to truly engage with customers, allowing their brands to ‘listen’ and ‘talk to’ them in real time, done at scale. Says VeerChand Bothra, the Chief Evangelist & CIO of Netcore Solutions, a leading marketing automation & analytics company that provides AI-powered marketing automation & analytics solutions to enterprises globally, “Marketers need to understand that AI is no longer something for the future - it is already here. It holds the key to hyper-personalisation while freeing up the marketer to do what we as humans do best: focus on creative, content, & strategy. Thus, contrary to perceptions, AI is going to make digital communications high-touch and marketing more human"
What does this tell us? It tells us that for us marketers, personalisation through content and product recommendation is no longer optional, since that has become the basic expectation of the customer. Moreover, AI can alert you when a customer is likely to drop out of the funnel – referred to as ‘flight risk’, so you can take appropriate measures to lure them back in or find out the reasons why they want to drop out. Marketers can gauge the true potential of AI by acknowledging the fact that these are still early days for this technology, and it will improve drastically with time. Early adopters stand to gain the most by cultivating a deep knowhow of how best to apply these technologies for best results. 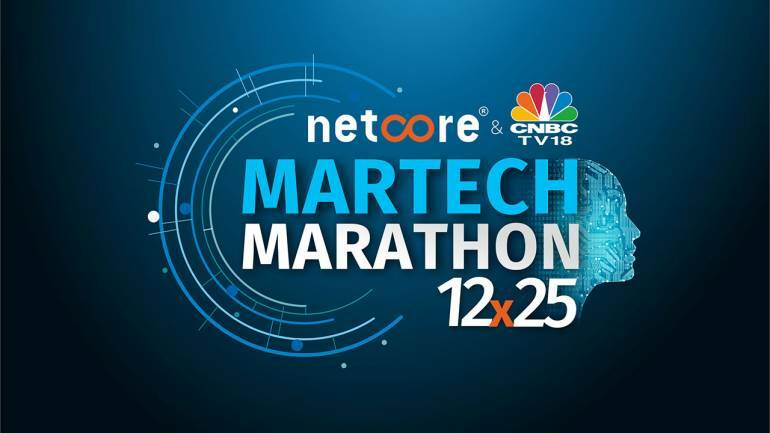 Marketers now have a great opportunity to find out more about the adoption of AI and marketing automation as 25 top Martech evangelists come together on a unique platform this June 13 in Mumbai, to share their knowledge with martech enthusiasts at the Martech Marathon 12x25, presented by Netcore Solutions & CNBC-TV18.